New close-up images of a Region located near Pluto's Equator reveal a giant surprise: a range of youthful Mountains rising as high as approx. 11.000 feet (such as about 3,3528 Km) above the Surface of the Icy Celestial Body which hosts them. These Mountains likely formed no more than 100 Million Years ago (true "youngsters", when their age is compared to the age of our Solar System, which is approx. 4.56 Billiony Years old), and they may still be in the process of building. Such a consideration suggests that the Region which we see here - and that covers less than one-per-cent of Pluto's entire Surface - may still be Geologically Active today. The Mountains' youthful age estimate is based (also) on the complete lack of Impact Craters in this scene. Like the rest of Pluto, even this Region should - presumably - have been pummeled (---> hit) by countless Space Debris of various dimensions for Billions of Years and, therefore, it should look Heavily Cratered. But the truth is that no Impact Craters are visible and so, most likely, some recent activity gave to the whole Region some sort of a "facelift", by way of erasing the existing Pockmarks (---> small and medium-sized Impact Craters). Furthermore, unlike the Icy moons of the 4 Gas-Giant Planets of the Solar System, Pluto cannot be heated by any kind of Gravitational Interaction (---> Friction) with a much larger Planetary Body, and so other processes must have been occurred in order to generate this Mountainous Landscape. 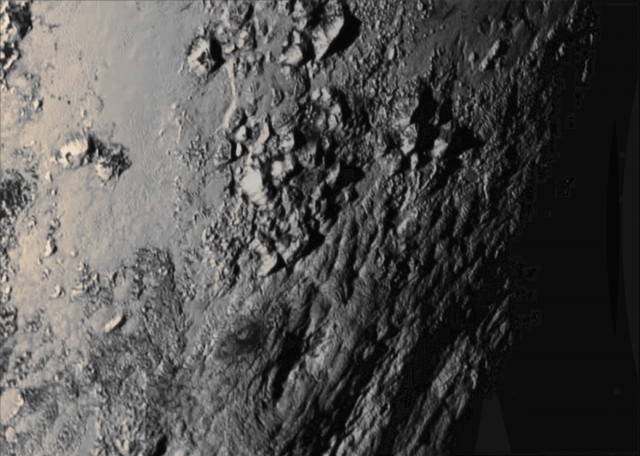 The Mountains themselves are probably composed of Pluto's Water-Ice "Bedrock." Furthermore, even though Methane and Nitrogen Ice covers much of the Surface of Pluto, these Materials are not strong enough to build the Mountains by acting "alone". On the other hand, a stiffer Material, most likely Water-Ice, could/should have created the Peaks. This wonderful Close-Up Image was taken about 90 minutes before the NASA - New Horizons' Spacecraft Closest Approach to Pluto, when the Probe was about 47.800 miles (such as approx. 76.926,452 Km) from the Surface of the Dwarf-Planet. The image easily resolves Surface Structures (---> Reliefs) smaller than 1 mile (1,60934 Km) across. The image (which is an Original NASA - New Horizons Spacecraft's b/w and NON Map-Projected frame published on the NASA - Planetary Photojournal with the ID n. PIA-19710) has been additionally processed, magnified to aid the visibility of the details, contrast enhanced and sharpened, Gamma corrected and then colorized (according to an educated guess carried out by Dr Paolo C. Fienga-LXTT-IPF) in Absolute Natural Colors (such as the colors that a normal human eye would actually perceive if someone were onboard the NASA - New Horizons Spacecraft and then looked ahead, towards the Dwarf-Planet Pluto), by using an original technique created - and, in time, dramatically improved - by the Lunar Explorer Italia Team.